Every carpenter needs to have a set of tools – hammers, saws, screwdrivers, etc. Good tools will serve you well in all sorts of situations, but over time, even the best tools will wear down and need to be replaced. 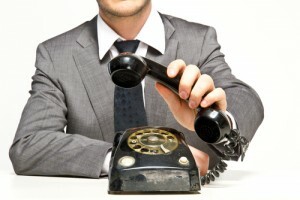 Just like carpenters, sales people have their own set of “tools” – the cold call openers that we use to introduce ourselves, create conversations, and start building relationships with new customers and prospects that lead to appointment setting, follow-up calls, referrals and eventually closing the sale. A good carpenter knows when to replace his worn-out tools – if you have a screwdriver whose head is stripped to the point of uselessness and a tape measure that doesn’t retract, you know that it’s time to buy new tools. Unfortunately, many sales people keep using the same worn-out tools – the same ineffective cold call openers – in their telemarketing and appointment setting efforts. Every cold call needs to serve as a conversation starter for lead generation, ultimately leading to appointment setting. If your opening lines are starting to sound “worn-out,” it’s time to take a fresh look at your telemarketing and appointment setting tool box and see what you can replace. Here are the 5 Worst Cold Call Openers. If you have any of these in your appointment setting toolbox, it’s time to throw them out and replace them with new telemarketing tools! 2. I am not selling anything. 3. Do you have a few minutes? So, what’s wrong with them? “I am not selling anything” is a classic telemarketing line that everyone knows is a lie. Sure, you may not be selling anything right at the moment, but you are selling the prospect on why they should trust you and why they should agree to an appointment setting with you. Prospects know that that anyone who says “I am not selling anything” will in fact eventually try to sell them something. Saying “I am not selling anything” is the fastest way to set off your prospect’s defense mechanisms – they immediately will become suspicious of your motives and start raising objections before you even have a chance to speak your piece. You won’t be very successful at appointment setting if you set off your prospect’s “sales pitch alarm” at the first line of the conversation. “Do you have a few minutes?” might be okay once you have established a strong relationship with the customer and you’ve proven to them that you have their best interests at heart. But don’t let this be the first thing you say to someone on a telemarketing or appointment setting cold call. The same is true with “I know you’re busy but…” By reminding the prospect that he/she is “busy,” you are also reminding the prospect that you’re interrupting them with a cold call. You have now started the call on a defensive, intrusive note, making it unlikely to lead to a successful appointment setting. If these are the opening lines you’re using for your appointment setting and telemarketing cold calls, it’s time to develop new ones. Your goal should be to not sound insincere, staged or robotic. Don’t remind people that they don’t know you; instead, show them why they should want to get to know you – and why they should welcome an invitation for appointment setting. Why is this a solid opening for an appointment setting or telemarketing cold call? It’s direct and honest, which is refreshing for the prospect to hear after being bombarded with dozens of “I know you’re busy but…” telemarketing calls. It states clearly who you are in a way that is approachable. It turns you into a fact-finder instead of a salesperson. This makes it more likely that the prospect will respond favorably to your appointment setting offer. It gives the prospect something to say “Yes” to. With this opening, the prospect’s next sentence is likely to be “Yes, we do that,” instead of “I don’t have a lot of time right now, what’s this about?” Great cold calls start with positivity and common ground instead of defensiveness and mistrust. It positions you as a peer instead of yet another salesperson doing telemarketing. You sound more like someone in an industry calling someone else in the same industry to discuss something and ask for an appointment setting, rather than trying to zing them with a clever opening line. Our list of the 5 Worst Cold Call Openers might have been useful telemarketing sales tools at some point in the past, but those tools have long since become worn out and need to be replaced. Start with a new approach to appointment setting, with honesty, directness and a spirit of helpfulness, and your cold calls will achieve new heights of success. Strategic Sales & Marketing is a lead generation and appointment setting firm founded in 1989, with a proven track record of helping clients in multiple industries achieve breakthrough results in creating high-quality business leads. Our consultants have completed over 50 millions sales presentations and generated over 7 million leads for our clients. Whether your sales team needs to improve their contact rates, streamline their appointment setting programs, or get better at closing the deal, the experts at Strategic Sales & Marketing can help take your lead generation program to the next level of success.